Has anyone had success using this? As the effect is intriguing, to either return your own characters with useful enter/leave play effects, or return their characters (ideally when defending on their turn) to slow them down. I've had a bit of fun with it. Basically, anything that annoys my opponent makes me happy. 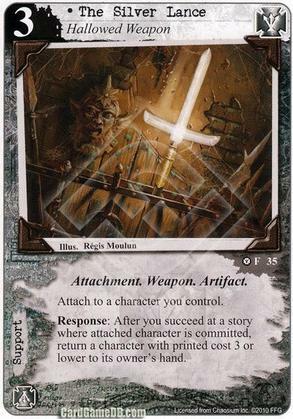 It comes with the caveat that I'd never run it in a deck without Josef Meiger though. It's also about the 3rd thing that he fetches out of the deck. I don't think it's worth either the resource cost or the space in your hand, but if you can ignore both of those, it's great. I played it in combo with Agency. But it triggered not that often. (I think it's a typical "late game card" it has never been my first choice if I could play something else. In my ST (return to hand) deck it's not working...other effect are much better and faster. I imagine I'll try it out some time, but treat it as a bonus. Smith629 - I do love Josef, so more things for him to get is never a bad thing in my mind. Orso - It was more the idea of doing it as a defender so they don't buy it back before I have time to abuse their board being reduced.